The skirt-into-shirt that started it all! 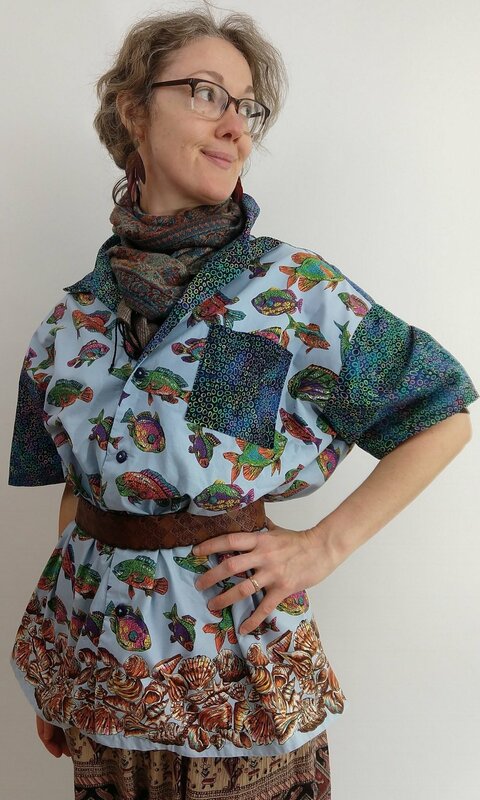 A life-long seamstress, I started making things out of other things in 2004 when I spotted a dowdy pleated button-front skirt sporting a wild tropical fish print in a thrift store. Once I turned that skirt into a Hawaiian shirt, I was hooked. Clothes became fabric! Making things out of other things became my primary means of creative expression. Each garment I make is one-of-a-kind. I work mostly with wool, cashmere, and silk, though other fibers sneak in, particularly if they’re striped. I adore pockets. Many of my garments have at least one, if not more. I use a combination of hand and machine sewing to balance durability and old-world charm. My process is both methodical and improvisational; the materials have as much say as I do. These are clothes made from other clothes; they have history! In some, you’ll find evidence of wear. These imperfections do not affect the overall structure of the garment. Instead, they add to the unique character of each piece. A hole becomes an opportunity for embellishment. A flaw becomes a draw. Mass produced clothing is transformed into one-of-a-kind treasures.